When the John Deere RSX850i burst onto the side-by-side it marked a decided change in direction and attitude at big green. The RSX marked the first true performance vehicle from JD and they made a big splash into the enthusiast market complete with a full vehicle launch and a heavy marketing push. However, after the buzz wore off, Deere nearly vanished from the enthusiast market, retreating to their agricultural roots where they continue to be a heavy hitter in the market. For 2016 the Deere is back with yet again another push in the performance side-by-side world with an updated RSX that features more displacement, more power, more torque, more speed and coveted options such as electronic power steering. While the staff at ATV World has yet to give the new green a shake down, here’s the official word from John Deere on the new RSX…it’s just enough to get your performance glands salivating for a test run over this long holiday weekend. John Deere announces the model year 2016 RSX860i, replacing the previous model RSX850i. The RSX860i provides enhanced performance and ease of operation for Gator customers. Updated features, including a new power steering option and backlit toggle switches, improve manageability of the utility vehicle without compromising performance. Changes to increase speed, add power steering and increase warranty were made with the consumer in mind, and are based on customer feedback and market-driven research. The maximum engine speed increased from 7250 rpm to 7750 rpm, allowing the RSX860i a 10 percent increase in top speed over the previous model. Electric Power Assist Steering (EPAS) is now an option on the 2016 model. The anti-kickback feature reduces the amount of unwinding steering when operating through demanding terrain. The system also senses speed and adjusts steering effort as the speed of the vehicle changes for improved terrain feel and maneuverability. All EPAS equipped vehicles are pre-wired for a winch. Utility vehicles with the winch-ready chassis greatly reduce the winch install time. The winch components that are pre-installed include a wiring harness, a negative battery cable and a disconnect wiring harness. For ease of operation during early morning/late evening, factory-installed toggle switches are now backlit for easy identification. For reduced noise, the front differential is a spiral bevel design. The helical design of this gear set is stronger and produces less vibration and noise compared to the straight cut gears found on many competitive vehicles. The steering knuckles and control arms are also painted post-machining to prevent rust and discoloration for a long lasting aesthetic appearance. The RSX860i comes with a 12 month or 1,000 hour factory warranty, double that of many competitive recreational vehicles. The machine can also be ordered in traditional John Deere green and yellow or Realtree® Hardwoods™ HD Camouflage. 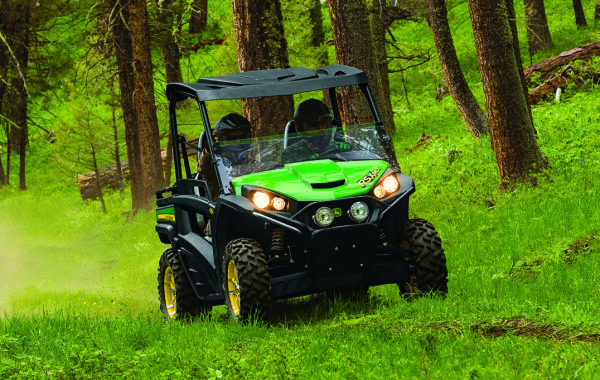 The Gator RSX860i High Performance Utility Vehicle is now available for order and will arrive at John Deere dealers in mid-July. Visit your local John Deere dealer or www.JohnDeere.com/Gator to learn more.